Our family enjoys a good family game night. With children ranging in age from almost 6 to 22, sometimes it can be hard to agree on a game to play. We were offered the chance to try out Sphero, an interactive robot toy for kids 8 and up, to incorporate into our family game night. Just looking at him, I had no idea how a robotic ball could please everyone in our house, but I was willing to give it a try. Sphero is a revolutionary tech toy that provides hours of open-ended play with multiple modes of interaction. Kids can use it independently, with friends or with the whole family. The best part? It can also be used as a seamless tool to introduce kids to STEM and the basics of programming. Each Sphero comes with a Quick Start guide, two ramps, a charging base, and information on how to download dozens of apps on iTunes and Google Play. We also received a Nubby Covers that protect against scratches and scuffs and also give you unbeatable traction. 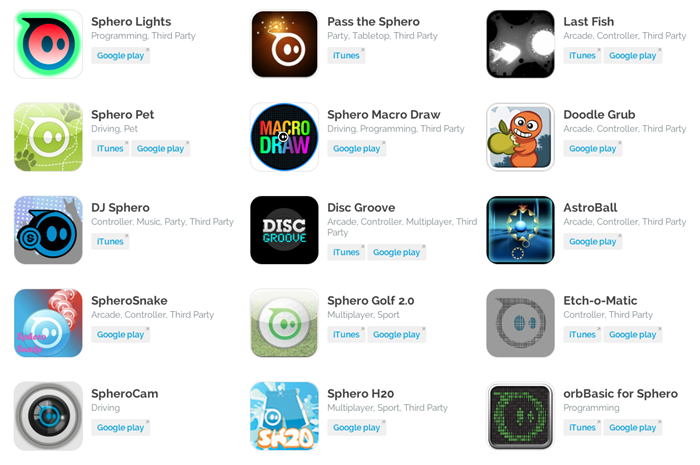 Sphero communicates with your iOS 4.0+ or Android devices with operating system 2.2+. The entire family took to the basics of “driving” Sphero easily. Even though Ethan is barely 6 and Emma won’t be 8 until November, it seemed second nature to them. Once Sphero is centered you can “steer” him with the digital joystick or by tilting your device. 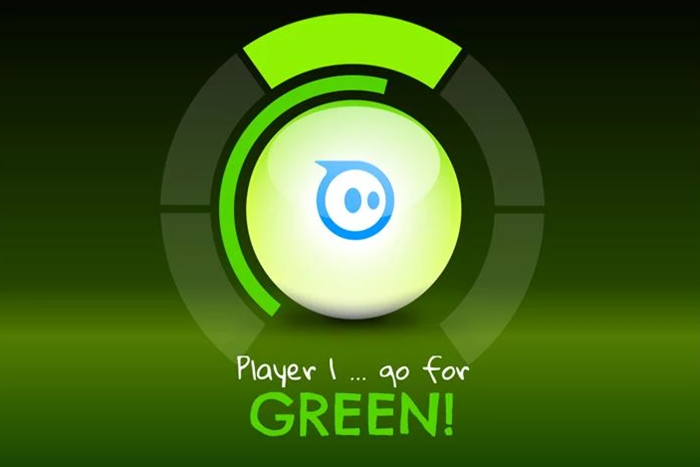 There is so much more to Sphero, though, than just “driving” him. be used around and in water! Sphero provides hands-on, open-ended play for hours of fun and learning… he’s ready for any adventure your kids can dream of. 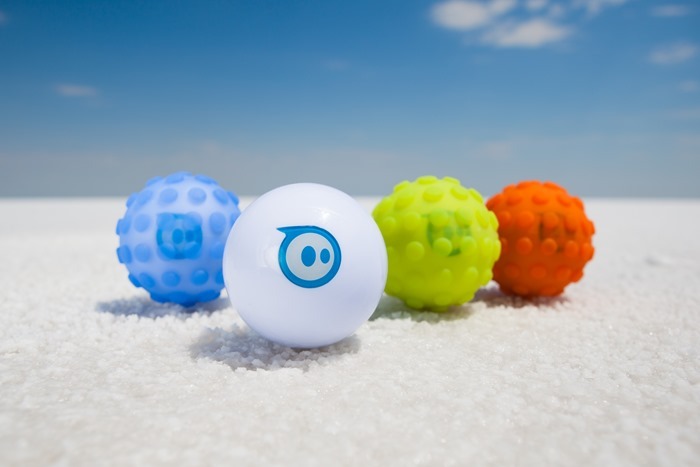 Sphero is so much more than just a ball to drive. With over 30 free apps, kids can play independently or with friends and family… making it a perfect family game night companion! 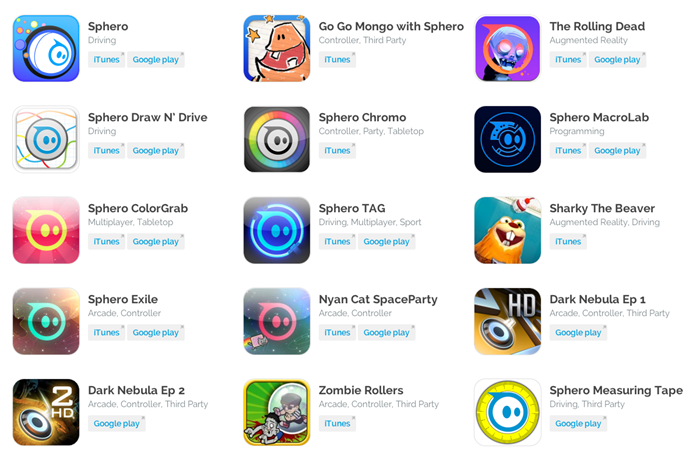 Steer Sphero through homemade obstacle courses, turn your living room into a video game with augmented reality, or upgrade family game night with action-packed, multiplayer entertainment. My 17 year old decided to get in on the “driving” action and wanted to pester our cats a little. Here is a short clip of his first “driving lesson”. My family tried out The Rolling Dead, Flappy Ball and Color Grab for our game night. The Rolling Dead uses your devices camera to show you an image of your room. 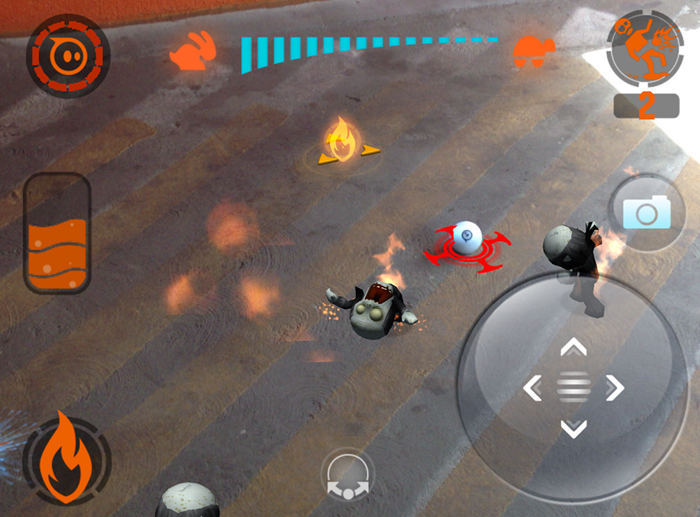 Use Sphero to squash zombies as the emerge from the ground! 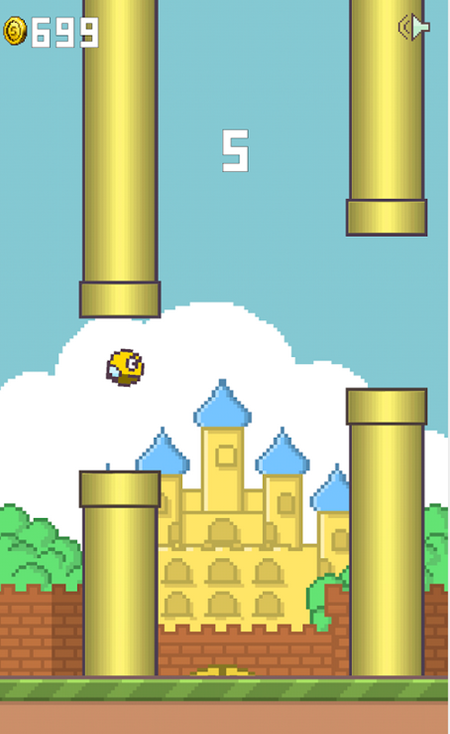 Flappy Ball is a take off of Flappy Bird. You shake Sphero to flap just like you would tap on Flappy Bird to get through the course. I personally loved playing Color Grab with the children because you can play multi-player and you can adjust the level of hardness so the younger children don’t get overly frustrated. Sphero flashes through multiple colors and the app tells you what color Sphero should be for you to grab him. Do it quickly to earn more points and 1000 points is your goal. On his own Sphero was pure fun to play with. Even my husband took him outside for a whirl around the cal-de-sac. 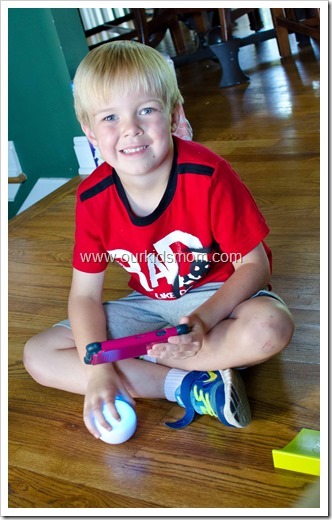 As a family Sphero was a shareable interactive toy that brought lots of giggles and enjoyment to our house. With over 30 apps to download a try you are bound to find several your entire family will enjoy! Meet Sphero 2.0 & get a taste of what he can do! This is so neat! My grandsons would enjoy playing with this in a few years when they’re a little older. Technology continues to amaze me! 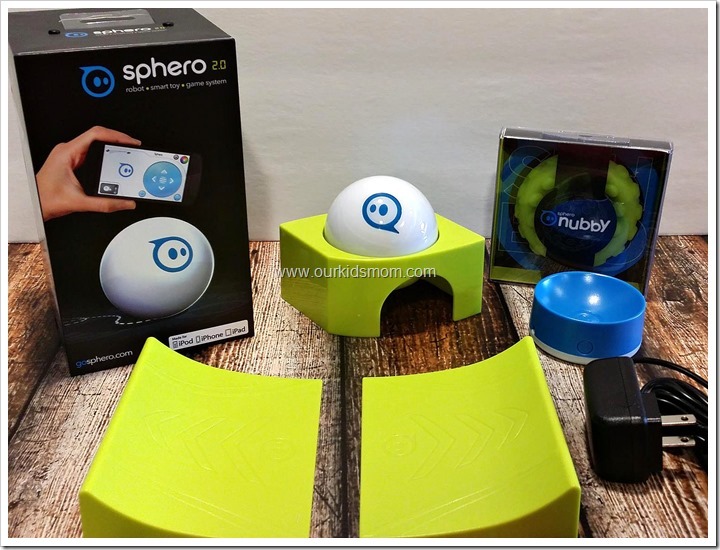 My family would have so much fun with Sphero during family game night as well as anytime. Looks like so much fun! i have heard a lot about this toy. it is great to teach kids about computers and programming. it can also be controlled from the smartphone so it should be around a while. im actually still not sure what it does but i guess it plays games! this will be fun when my kids get to that age. who knows what will be developed by then!! This interactive toy actually looks like a lot of fun. I bet my 2 year old could get the hang of this, and it would probably drive my dog crazy. Hehe! This looks awesome! My dogs and baby would go crazy over this! I am an IT Teacher and I would LOVE to have one of these for my classroom to use with the Macrolab app! I like how many different games at different levels of difficulty there are. I am sure my kids would get a real kick out of Sphero and I can see our dog Harvey joining in on the fun as well.